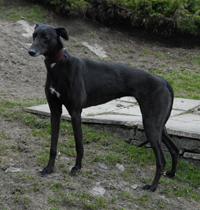 Went to her new home on Wednesday 12th June 2013 . 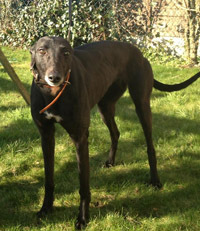 Beauty is a small black ex-racing greyhound who was born on the 14th August 2006. 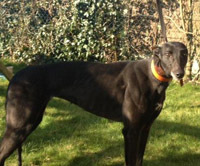 She was with her ex- owner and trainer since a pup, and she is Bess's sister. Beauty arrived this lunch time and after all the transfer paperwork was complete and photographs taken, off she went with Julia and her daughter to her new foster home. This is where she will stay until we can find her a forever home. 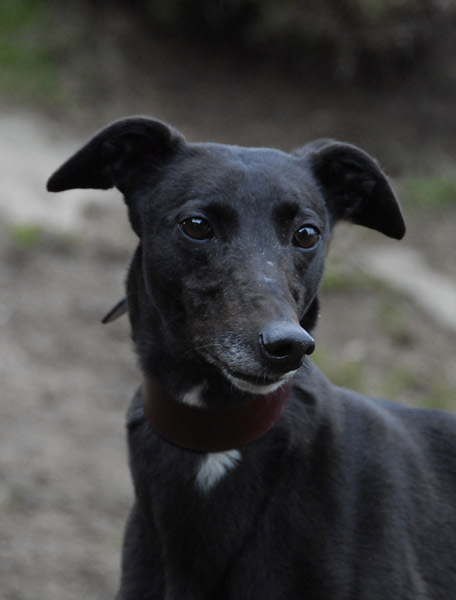 This evening we received an email from Julia letting us know that Beauty never bothered at all when she met her three dogs (lurchers and a labrador) and hasn't since. She is happy to let them sniff her and she sniffs them. She has been in the garden on her own and not shown any signs of wanting to jump the walls, which is a good sign, but Julia will be closely watching her for the next few days. 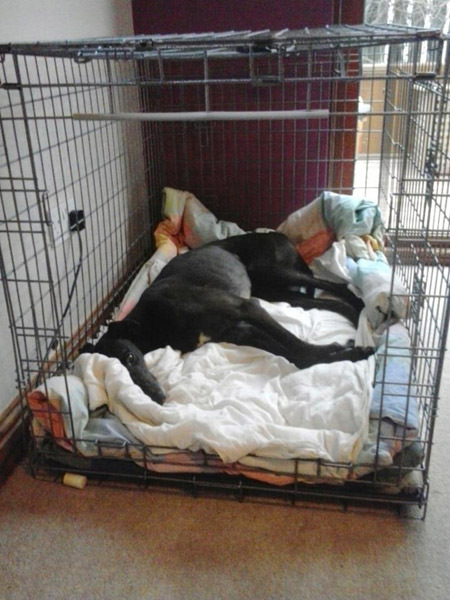 Beauty was overcome by the smell of the sausages cooking for tea and got a few water sprays to stop her jumping up at the work surface, but when they sat down to eat she went in her crate and fell asleep. She seems to really like the crate, so she will try letting her sleep in there tonight. 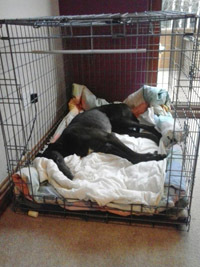 She walked into Shane's, the lurcher's crate, did a wee, walked into her crate and fell asleep just before tea. Shane was not impressed, but he likes the nice clean bedding he now has. That was the only wee she has done in the house and she was just leaving her scent, not a proper wee. 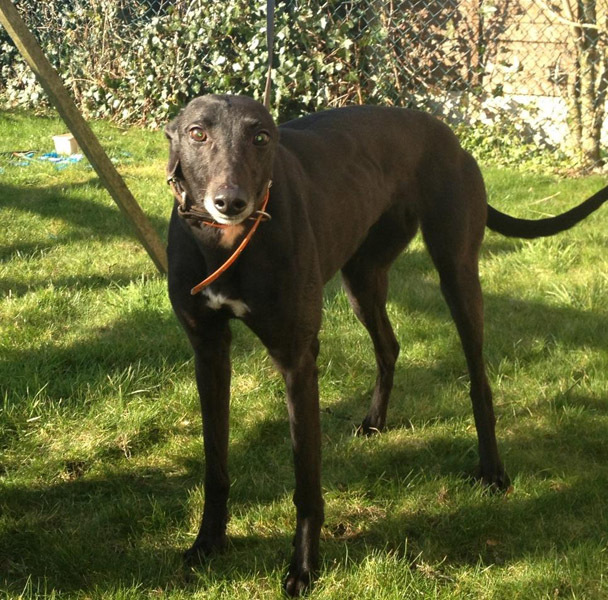 Beauty is very affectionate and is loving lots of cuddles. She loved her tea and ate with the others without a problem, and at the moment all is good. Beauty slept by the side of Julia's bed last night and she never heard a peep from her. This morning Julia took her for a 3 mile walk up the fells. She put her coat on as the wind was very cold. She was very good and walks nicely on the lead. She never bothered that Shane and Maisie were racing around. This morning everyone had dentist check ups so Julia left the dogs. She put Beauty in her crate as she is still wanting to follow her all over. 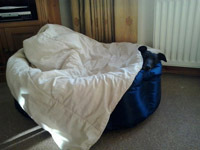 When they got back they found she was fine in her crate and had obviously just gone to sleep. She spends most of her time sleeping in one of the crates and she swaps with Shane every so often. However, at the moment she is in Hazel's! 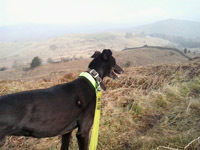 We received an email this morning with a picture of Beauty taken on her walk yesterday while up on the South Lakeland Fells. From the way she was looking I think she was enjoying the view! Julia sent us a picture today of Beauty in her bed. Julia says "This is her favourite bed, sometimes she lays on top of the quilt and sometimes underneath it". We heard today that Beauty has settled down well. She thinks she is not going to be cat or small dog friendly. She doesn't seem to bother with larger dogs but can spot a small dog or cat from quite a distance and gets quite excited over seeing them. This we will need to assess more closely. Other than that she is great. She walks so well on a lead and they go for miles over the fells and along the roads. She is fine in traffic. Yesterday she discovered the joys of a ball which was lovely to watch. She is flat out now as Julia took all the dogs for a 5 mile walk this morning because it was too nice to be in. Beauty is fine, very easy going around the house and on most walks. Still grumbling when she meets a new dog but no aggression follows the grumble. Not bothered by Shane, the lurcher running around with his Frisbee or Julia throwing it for him. She just watches. 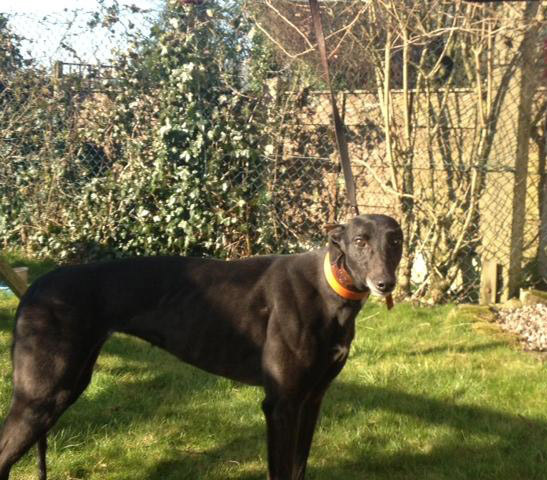 Julia says "Bess is a lovely girl and things sound promising for a new home. Beauty is so laid back, very easy to look after. She loves her walks and chills for the rest of the day, when she gets back. She loves the Tuffies nest bed and rarely gets out of it". Julia went to check the home where Beauty is possibly going to live. The home check was a pass. She said Beauty would be very safe in the garden area and fields. All have boundarys of walls with fences on top, or very good stock fencing. The area near to the house she would be free to wander in was very safe. The house is very isolated so no chance encounters with small cats and dogs. She showed very little interest in the peacocks and sheep. They walked through the field with the pet sheep, which ran out of the way and Beauty never bothered with them. This morning Beauty went to the vet to be spayed where she weighed in at 24.9k. There was a cat in the waiting room in its basket, and it wasn't being quiet! The cat's basket was less than 2 yards from Beauty and she ignored it! When Stuart called to collect Beauty later in the afternoon she looked decidedly sorry for herself. Once home, she made her bed at the top of the steps in the kitchen, which led into the guest sitting room. There she lay most of the evening until Julia and her daughter arrived to take her home with them. Beauty started bleeding through her spaying stitches during the night so she was admitted to the vets this morning for an ultra-sound scan. The scan revealed there was no pool of blood inside nor any internal bleeding, however, there was some bleeding just behind the stitches, and in case it was the beginnings of an infection she was put on antibiotics. The vet mentioned to Julia who was fostering her that the bleeding may continue for a few hours before it stops. This is exactly what it did. This evening Beauty came and stayed so we could take her to the vets tomorrow morning to have the tooth out the vets x-rayed while she was under the anaesthetic being spayed. One of her front canine teeth had broken off and the x-ray showed the beginning of an abcess forming, so the vets thought it best it came out. 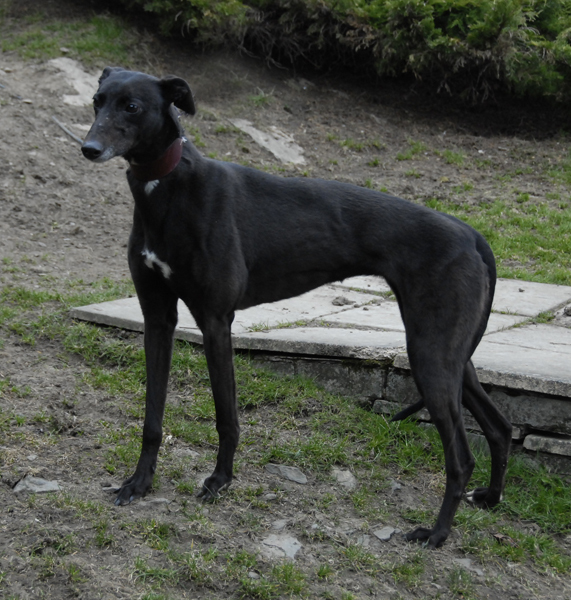 When Beauty arrived she met all the other greyhounds, many of whom she met the last time she came and stayed the night, then wandered off around the garden. Sooty was a little 'over the top' with her and growled a few times so she was shut in the kennel to give Beauty a bit of peace, and to avoid the possibility of a confrontation building up. This morning we took Beauty to the vet for her dental where she weighed in at 24.9k. Her tooth was sorted and we collected her in the afternoon. Still rather groggy and looking very sorry for herself she went off with Julia back to her foster home where she received the tlc she needed to make her feel better. Beauty is on 5 days of Metacam to ease the pain and she's to have soft food for the next 10 days because of her stitches. 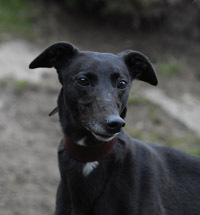 This morning Beauty went off to her new forever home. She was pleased to see her new owner when she came to collect her, wagging her tail when she arrived and jumped up on the sofa and lay next to her as she chatted to Julia. She happily jumped into the back of the car and lay down as if she had been doing that for ages, and off she went to her new home where we hope she will have a long and happy life. We heard today that Beauty is getting on fine. Her new owner took her to the vets because she was worried about the stitches. Her new owner's vet phoned our vet for information about the spaying and has given Beauty 10 days of antibiotics. Other than that she has settled in really well. Has her own quilt and pillow next to her owner's bed, and she is covered over with a blanket every night. We think she is getting quite pampered!